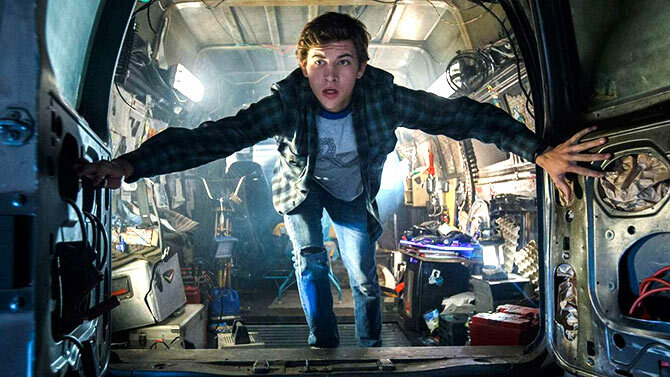 In Ready Player One, Steven Spielberg returns to an arena he predominantly parented with the optimism of a kid who hasn't forgotten what it's like to be an audience, notes Sukanya Verma. Steven Spielberg is the father of spectacle. The film-maker's singular vision in weaving ambitious drama around cinematic sorcery launched the age of blockbuster entertainment. In Ready Player One, he returns to an arena he predominantly parented with the optimism of a kid who hasn't forgotten what it's like to be an audience. Another Jaws or Jurassic Park this isn't, but one cannot imagine a better or bigger movie geek to helm this feverishly paced big screen adaption of Ernest Cline's 2011 bestseller. Usually the subject of tributes, this time it is Spielberg who is doffing his hat at as many pop culture references possible from the world of movies, music, fantasy novels and video games to embody the book's retro-loving spirit. Nerdy nostalgia is killing it as a genre and still a few projects away from burn out before it resurfaces again in a brand new form to celebrate another bygone generation. Superfluity is the very point of popular culture which thrives on mention and the giddy level of greatness trivialities acquire in memory over time. Ready Player One flatters this notion by paying homage to the icons of the 1980s with all it has got. Spielberg hits a massive fanboy and girl nerve to turn the conflict between geeky idealism and corporate capitalism into a sport of spot-the-allusion. Famously fictional props and characters watermark its kinetic scenery. King Kong, Gundam The Iron Giant, Harley Quinn, Chucky, Street Fighter, Moral Kombat, Mario, MechGodzilla, Jurassic Park, The Fly, Alien, Star Wars, George Michael, Steve Jobs, Stanley Kubrick, John Hughes, Robert Zemeckis, the Bee Gees, Joan Jett, Michael Jackson, Atari 2600, Nancy Drew, Bill & Ted's Bogus Journey, Akira, Christine -- it's an exhaustive list of expertly laid out references powering the sci-fi potboiler's God-is-in-details agenda. Backed by the wonders of immersive IMAX 3D technology and awe-inspiring CGI, the propulsive action takes a life of its own. Ready Player One is set in a congested dystopian future, where slipping on glossy haptic gear and assuming simulated avatars within the virtual world of OASIS can take your mind off the horridness and cynicism of real life. It certainly allows Wade Watts (a pleasant Tye Sheridan), a shy orphan from Ohio to escape his shabby existence and rock the virtual scene as Parzival, his gaming alter ego and top contender to win Anorak's Quest, a game within OASIS, the revered VR community built by the late James Halliday (played by Mark Rylance with a conscious jitteriness). Halliday is a less whimsical Willy Wonka to Parzival's Charlie Bucket, but his humour for competition is much alike. Curiously recorded scenes of his life play out posthumously like a library of clues in real-time, one that Parzival frequently visits to find all the hidden eggs and win the game before Nolan Sorrento (Ben Mendelhson's scowling face does its bit as the business-minded villain) does. What it really conveys though is the loneliness of a life not quite as exciting as the alternative he made. Spielberg is quite capable of making a separate feature on Halliday alone, one that would be super poignant and award ready. But Ready Player One doesn't dwell on existentialism. Gaming is a matter of life and death here. He empowers Watts and his VR world companions -- a spunky, red-haired Art3mis (Olivia Cooke is so good, the movie should have revolved around her), the mechanic best pal Aech (Lena Waithe) and sprightly sidekicks Daito (Win Morisaki) and Sho (Philip Zhao) -- through a series of daredevil quests that strives for adrenalin over wisdom. Too bad these characters don't rise above standard support and cultural representation. Still, the journey is fun for as long as it lasts. I've not read the book. My husband has and loved it to bits. While mesmerised by Spielberg's exhilarating depiction of OASIS, he was bummed out about the dumbing down of the non-gaming portions to create a more conventional, concentrated, view of a sprawling narrative, the usual 'best chapters left out to accommodate a overblown third act' gripe. And while the third act is indeed a blazing explosion of ridiculously excessive combat and pop culture clutter, to someone who isn't familiar with the book but knows her Spielberg well, the spectacle feels more go for broke than gratuitous.